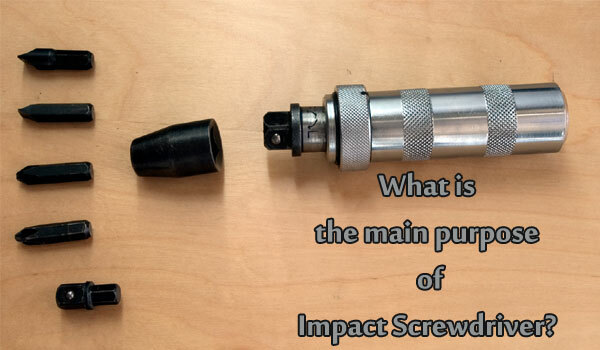 What is the main purpose of Impact Screwdriver? HomecommonWhat is the main purpose of Impact Screwdriver? Impact Screwdriver or Impact Driver forms part of a masons or builders toolkit. It can be a hand tool or electric and often comes in a kit available with interchangeable heads for both screwing and drilling. The impact driver is used because it is hard wearing creates strong downward force and therefore allows for efficient drilling of very hard materials such as stone and concrete or brick and cement. When used as a screw driver, the impact driver delivers a torque higher than that achieved by hand. Conversely, the Impact Screwdriver is also essential for loosening hard to remove screws which are either corroded in place or over-screwed. The Impact Screwdriver delivers strong rotational downward force delivered by the inner core that has teeth which turn inside a shaft creating torque. The outer shaft is often of a heavy metal material to withstand shock and impact. A manually operated impact screwdriver will have hammer and screw action. The Hammer or Impact action is delivered by cam discs which rotate transforming rotary motion into linear downward motion to continually drive the drill bit or screw driver forward. The hammer action is actually created by a pair of crammed discs and a spring-loaded chuck. The electric version is controlled by a variety of speed settings for better control. An impact screwdriver looks like a traditional screw driver, with interchangeable heads or bits. An electric version may have a battery charger to enable it to be cordless. They often have non slip grips and electric versions are available with different motor power ratings. Since the impact screwdriver or drill may be used in very resistant materials, it is imperative to use the correct chucks and drill bits to avoid accidents or harm. Specific tungsten carbide tips are available for this purpose. When using the Impact Driver as a drill, often the drilling action creates dust, and fine particles which may be harmful. It is important to consider eye and mouth protection when using these tools for extended periods.